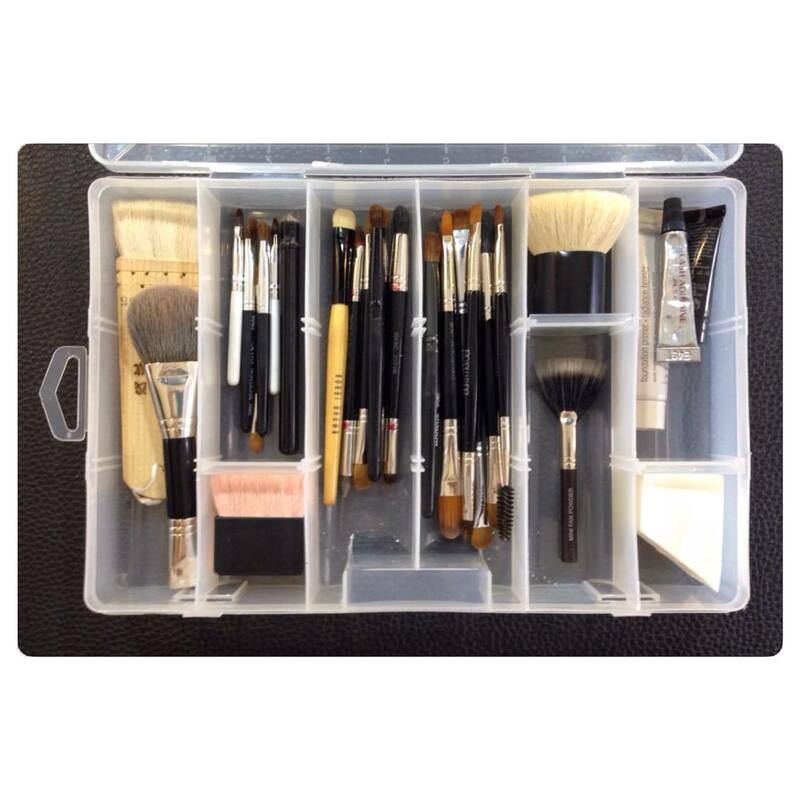 If you are an aspiring makeup artist, I suggest that you build an emergency brush kit. Trust me, you’ll need it. It always happens on a hectic week; in between shows, private clients, Mars taping and TVC shoots. When I am pressed for time, I do a simple cleansing routine on my brushes after work that evening. After cleaning them with a brush cleaner, I put them on a rack to dry; ready to be used the next day. I get to work and start setting up. As soon as I open my light box, my brush belt is not there. I realize that my brushes are still at home; on the rack beside the kitchen counter. I panic. Going back home to get them is not an option. Manila traffic is not my best friend. I stop for a minute to think of what to do. It dawns on me. I have a “purse” full of brushes in my back pack. I start to relax. In my entire professional career, this has happened to me twice. From then on, I have always been mindful of my brushes. I never intended to build an emergency brush kit. It just sort of happened. Early in my career (circa 2009), I had a fascination with double-ended brushes from Laura Mercier. I collected them when she’d release them as limited edition travel sized brushes during Christmas season. It’s practically everything that you’d need to complete a look. The brushes you can see above are a combination of two brushe sets released a year apart. One was sold as a traveling brush set and came with a brush purse. The other one was sold as part of a smoky eye set. Because of this, I practically have brushes for foundation, powder, blush, eye shadow (cream and powder), eyeliner, brows, concealer, and lips. To this day, I tend to save brushes from used blush sets from Benefit, mainly just for posterity. The brushes remind me of kabuki brushes from Japan. That small fan brush came with a tester set for some mineral powder from Laura Mercier. I have two C157 brushes from Crown Brush that were a gift from my best friend Nat. All of these were in a small brush purse that I kept in my back pack. Let me say that these brushes were not really “kept”, they were constantly being used in conjunction with my full-sized brushes. It even came a point that I used these mini brushes more often than the full-sized ones. I relegated these brushes to “emergency brush set” status after I left my brushes at home for the second time. A week ago, I decided to revamp my emergency brush kit. The brush purse has finally out-outlived it’s use. I now house the brushes in a small container intended for tools. This keeps the bristles from bending out of shape or the brushes from snapping in half. I’ve added a few brushes that I don’t use on a regular basis. Like the lip brushes from the OCC Lip Tar kit and an old Makeup Forever Lip kit, The Touch Up Brush from Bobbi Brown, The Mac 183 Flat Top Kabuki Brush (currently discontinued) and an Ita Kabuki Brush. I’ve also added some testers (primers and foundations), eyelash glue and a triangular sponge to the mix because “you’ll never know”. Many of the popular brands have travel brush sets for sale all year round but it’s only displayed prominently around Christmas season. There are some brands that include mini brushes in an eye/ lip palette. You do not have to buy everything in one go. It’s best to check what you have then look around and see what you need. This is a great idea not only for makeup artists but for ladies out there. Especially those type of women who doesn’t like to splurge on a full-sized brush but appreciates the quality of a well made product. 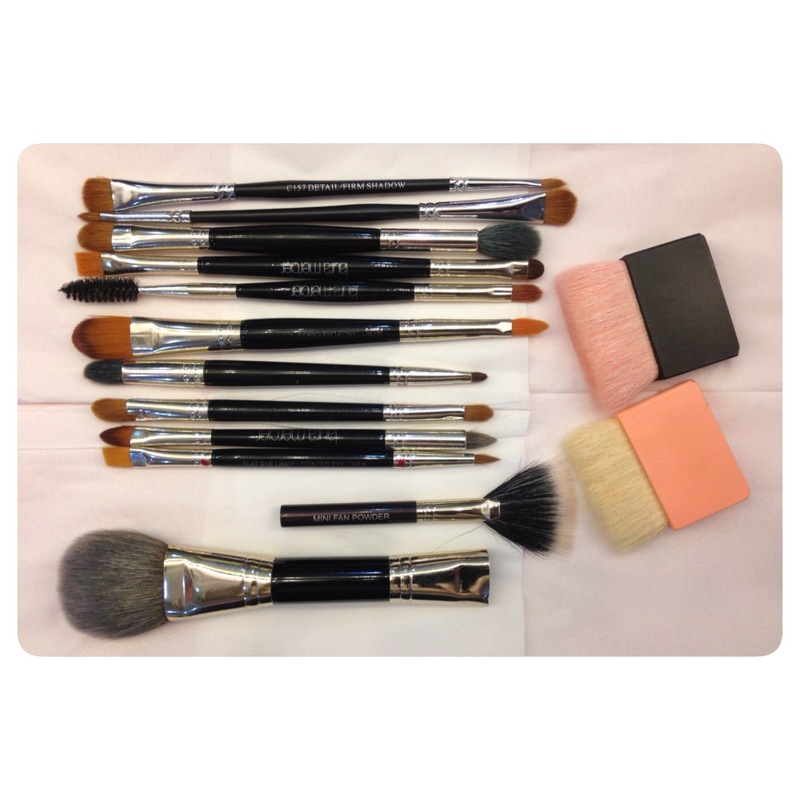 Usually the price of a travel brush set equals to that of a single full-sized brush or even two full-sized brushes; depending on your chosen brand. So choose and spend wisely. If you are primarily working in a city like Metro Manila, where traffic is horrendous, back tracking home to get your brushes is not a good idea. TIME is of the essence so it’s always best to be prepared. It pays to have an emergency brush kit in your bag.